Verdi's Celeste Aida for violin has been transcribed for violin by Ernst Schliephake, who has served as the associate concertmaster of the Munich Symphony Orchestra since 1989. He has edited numerous works for classical music publisher G. Henle Verlag. Mr. Schliephake also had a long friendship and collaboration with the legendary violinist Ruggiero Ricci, until Ricci's passing in 2012. Celeste Aida (Heavenly Aida) is a romanza from the first act of Giuseppe Verdi's opera Aida. In the original version, the tenor solo is sung by Radamès, a young Egyptian warrior who dreams of being chosen as a Commander of the Egyptian army, achieving glory through victory on the battlefield, and obtaining his secret love: the Ethiopian slave girl Aida. Celeste Aida has received numerous recordings and performances by titans such as Luciano Pavarotti and Mario Lanza, the latter of which was the inspiration for this edition. I was inspired to create this edition of Celeste Aida by that amazing recording of tenor Mario Lanza... I loved it. So, I did a transcription just by listening to the CD of Lanza, without having any of the written score in front of me. I remember that in the end it took me three days to get it on paper. I gave it to Ruggiero Ricci in the summer of 1993 on his 75th birthday when Ruggiero lived in Salzburg and was teaching at the Mozarteum University of Salzburg. Two years ago violinist Almuth Siegel – a pupil of Ingolf Turban, who was a close friend of Ricci – gave the first live performance of my edition at the Hochschule für Musik und Theater München (University of Music and Performing Arts Munich). 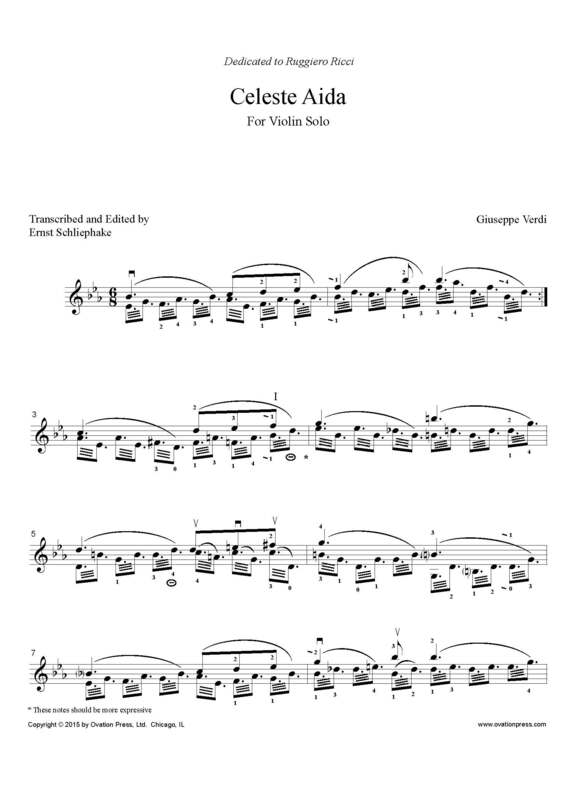 Download and print the score today to gain access to this expertly edited transcription of Verdi's Celeste Aida for violin by Ernst Schliephake! Check out this video of Mario Lanza singing Celeste Aida.